← Cleaning H’s Room: Aaack! Will we ever move on from this? I have been preoccupied with the ideas of self-advocacy lately. I am so motivated to delve into this – to understand more about the developmental components and the building bricks that will support the skills of advocacy. I know… I KNOW… special interest much?? The line between my shadow traits and the traits of those on the spectrum can be surprisingly thin at times. Actually though… that is what makes me good at what I do. I get social (well, most of the time) and I get autism (again, most of the time)… because even though I am NT, I think differently… and I can understand and explain both perspectives. That is what my work here is about: my efforts are to build bridges – not walls – because that is what leads to understanding, and our world needs more of that. I am motivated to understand the developmental progression of self-advocacy because I want H to be able to have the self-understanding to express what he needs from others. This is complicated and multifaceted – and I am in the midst of crafting a more in-depth post on the topic. Part of this process, however, is supporting H’s ability to embrace himself as being autistic. So I have been looking for opportunities to build his positive view of himself that includes being autistic/having autism. It says so much on so many levels! Immediately I asked if it was OK with him (AspieKid) if I could use his phrase on a shirt for H. It is such a fabulous play on words and meaning on multiple levels and such a positive message of empowerment for my child. So… on our way to the pediatrician this morning …we embarked on our conversation. I just love car talks. Just like walking side by side is a wonderful way to connect with kids, riding in the car also offers huge opportunities for that easy lateral conversation – as opposed to face-to-face heavy eye-contact interaction. This is effective for my child with autism – but it has also been an amazing approach for my neurotypical daughter. And… too… upon reflection, I suppose H is belted in and trapped when we are in the car – so there is little opportunity for avoidance-behaviours and fewer competing distractions! H and I discussed special interests and inventoried many of his. We talked about the value of these intense interests and how this sometimes becomes a connection to what people do as an occupation when they grow up. Then we explored the ideas and connections between occupational therapy, occupation, pre-ocupation, and preoccupied. I wanted him to understand the multiple layers of AspieKid’s wonderful line, and share my perspective about how it shines light on one of his traits in a positive way. Then – because I thought maybe he just didn’t want an embarrassing mom’s-gone-all-artsy-again kind of shirt, I explained that we could have the message put on a shirt professionally. “I would maybe wear it to a conference… but not just out there,” H indicated outside the car. “No,” H shot out a rather abrupt response. H is comfortable in self-identifying as autistic/having autism around adults who understand about autism. At Arizona TASH he was exuding joy and full of pride over his autistic traits as a part of his entire being. I hadn’t expected this reaction and the differentiation between those who accepted him and the need to hide being autistic if he was uncertain of the response. I was surprised at the depth of H’s thinking – but perhaps I should be more surprised at my lack of insight. I then talked with H about what people get to see of autism. Honestly though, I am just coming to have more insight around this myself, and it is for a large part through my interactions with Laura Nagle that my thinking is being shaped. Here’s the thing… if the only time we share that someone has autism – is when they are having a melt-down or struggling with something – then people only get to see the challenges. I reminded H of the time we spent with Laura Nagle, and how she sometimes flaps when she is very happy or excited. “You are right buddy, but did you notice that Laura doesn’t hide that? And sometimes when someone looks at her she acknowledges them and explains that ‘it’s a PDA: that’s a Public Display of Autism!’ and then she just caries on. She also shares with all sorts of people, like cashiers at a store, that she has autism. She says that people need to see and encounter those with autism out and about and living their lives. It upsets and saddens me that my child feels so judged… and his reaction is still based in shame. The framing of autism as an epidemic and a tragedy is insidious and pervasive in its attack upon the well-being and self-image of my child… and maybe yours. I am also haunted by the irony that as I am teaching my child to use his skills to understand the perspective and experience of others – it opens him to unfortunate realization that those less understanding and accepting of his experience may judge him harshly. I am not trying to teach my child that autism is all rainbows and sunshine and joy. Having autism makes life difficult for my child – EVERY DAY… but autism is a difference that also gifts my child some things… like an incredible capacity within his areas of interest. Of course, H is not solely defined by autism… but it is a difference to his very core – and I want him to feel pride in all parts of himself. We are working to give H the skills to advocate for himself and use his strengths to the best of his ability: cognitive strategies to better negotiate the social world, self-understanding, self-regulation skills, and more. But I think we still have a long way to go to build understanding for those who experience the world differently – and part of the equation may just include a careful contemplation of the value of sharing, like Laura does, the way that autism touches our daily lives in those moments when it is not obvious. I so appreciate the connections I have with autistic adults like AspieKid and Laura Nagle and the way that they nudge me to consider other perspectives, and help to better understand the journey of my child and others like him. This entry was posted in acceptance, Arizona TASH, Aspergers, Autism, Autism Positivity, connections, Diagnosis, label, Laura Nagle, Neurotypical, perspective of others, promote social understanding, self-advocacy and tagged AspieKid, Autism, awareness, development, intense interests, Laura Nagle, OT, PDA, Perspectives, preoccupation, public display of autism, self-advocacy, shame, Special Interests, strategies, Tragedy. Bookmark the permalink. 26 Responses to Preoccupation with another layer of autism stigma: Crap…this goes deep! You make some great points here, and that is a great line. I would say, though that, advocacy should always be a personal choice, and your son should have the choice whether he wants to become an advocate, or just be free to live his life. If you love the idea for the shirt so much, you could always wear one yourself. I had a hunch his reason might be something like that. This is a great post and it makes me want to resume work on a post I have about 25% written on the topic of autism as a social movement. That unfinished post associates autism with the civil rights movement, the women’s movement and the gay rights movement. When we think of those movements, we look back on the first gay men to come out of the closet and hold gay pride parades, and the suffragettes who fought the battle of first wave feminism, and the first black students to arrive in schools after the US Supreme Court abolished segregation in the school system. Today we think of these people as heroes and heroines and pioneers who paved the way for future generations. And that’s what they were. None of these groups of people would be as free or as accepted in society as they are today if it had not been for those pioneers. But their lives were hell. Some of them did not even survive. Imagine being one of the black students to attend school with white kids, with your textbooks and school supplies in hand, and people protesting and shouting racist insults at you (http://www.nysut.org/images/nyt071101freebies01.jpg), fearing for your safety and trying to keep your composure lest they blame you for any violence that might happen. I know that feeling very well. H is right. When I first started my blog I thought my messages of positivity would receive nothing but ridicule. I wanted to make a difference and for a while I thought about making a t-shirt that said “Not Neurotypical” on the front, with the hope that people who know what neurotypical means might be more accepting of autistics, but I never had the nerve to make the shirt because I wouldn’t have worn it in public. We are fighting another social movement to end another form of discrimination as I see it, and nobody wants to be the first one to stand up and boldly proclaim to the world, “I am one of the people who lots of people hate!” It is not easy being one of the first ones. The civil rights movement is glamorized and glorified on TV today, but the first nine students to attend public schools in Little Rock AR had to be escorted by the 101st Airborne Division of the United States Army (http://upload.wikimedia.org/wikipedia/commons/a/a0/101st_Airborne_at_Little_Rock_Central_High.jpg). Fortunately, it isn’t quite that bad for autistic kids today, but it isn’t that much better either and there are a lot of similarities. So I can relate to H’s concerns. Autism is definitely nothing to be ashamed of, but it can be scary to go completely public with it, not because of shame but because of hatred. That is exactly the reason why no one knows my real name and no one knows what I look like as an adult. But with that said, I think you should make the t-shirt so he can wear it to the conferences in a safe environment where he knows it will be appreciated. This is his path – not mine. He is just beginning to learn about self-advocacy. He is ready to learn now – at 13. I can be there and walk along side him while he is gaining skills and confidence, but the steps must be his own… so that he can make his way in whatever self-determined way he chooses in his adulthood. You know, this is one of the reasons I’m scared of saying “I’m autistic” to anyone in my real life. I know that I should be “out and proud” and proving to the world that autism isn’t a horrible thing, and that I’m just as much a person as anyone else is. But it’s scary to do that. It’s not like people don’t know, but the word is different. I’m “quirky” not “autistic”. The instant “autistic” appears, I’m no longer considered a person, but a label with a whole lot of negative baggage. 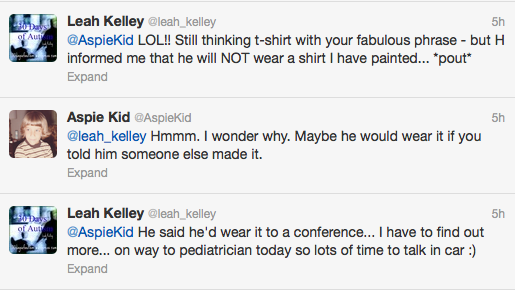 Like H, I would love to wear a shirt like that to an autism-related conference. I have a small group of friends in my real life whom I am “out” with (and most of them are autistic), and I would wear it around them. But I just haven’t been able to bring out the autism in front of people in power. In response to Tam above, one can be an advocate in a number of ways. I’m an advocate, in my own way. No, I’m not an advocate in my “in person” life – I’m a scientist, a graduate student, a “professor in training” if you will. But I can and do speak for myself online. However what Leah is doing with H, giving him the venue to express himself however he feels comfortable, WHEN he feels comfortable, is such a gift. She’s not putting him up on a pedestal and saying “H is a self-advocate for the autistic community”. She’s giving him the chance to choose to do so, and feel safe doing so, if he wants. And that is the best thing she can do as a parent – help her son find his voice and feel safe using it if he wants. Part of the reason I’m so darn scared of saying the words “I’m autistic” to anyone in my real life (though quite honestly, most of them know, even if they don’t have the term for it), is because my parents quite literally beat into me, the idea that being autistic was dangerous, and if I ever let anyone know, I would fail forever and no one would ever respect me or treat me well or consider me a worthwhile person. I know that most people in my life wouldn’t do that, because they know and like me for *me*, but what about those who don’t know me yet, but who are making hiring decisions? Would my phd advisor feel its necessary to disclose that I am autistic in a reference letter? As if he were lying if he withheld this information? If he had to put it in, would the hiring committee immediately write me off, despite the rest of the letter saying what a good scientist I am, just because of one word? These are things that have to be considered for one’s own protection. Yes, it’s sad we live in a world where this is true, but it is how it is. And the catch-22 is that if I want to change it, most people believe that the only thing I can do is put myself on the chopping block and hope that everything will work out. That’s not terribly fair, now, is it? E… your comments were so insightful and heartfelt. Thank you for your supportive words (which had me tearing up) and thank you also for expressing the raw reality of the fear of disclosing. This is complex – and it is so important to understand the multiple layers of those complexities. I am grateful to you for sharing so honestly and with such depth… and I am grateful to have you and other autistic adults who share their experience and thoughts here. You are an invaluable resource and we all need to be ‘listening to autism’ whether it is our own child or wonderful people like you. This is what stretches my understanding and helps me be a better mom to H… and a better educator! I think this is a brilliant post, and although I don’t have the eloquence to write as well as you. this is the direction i would love to go with my Son, I’m not autistic, but I am a disabled person so i experience the judgements and negative assumptions the world makes. I also understand many of the issues my Son faces, because on many levels I find the same things hard. 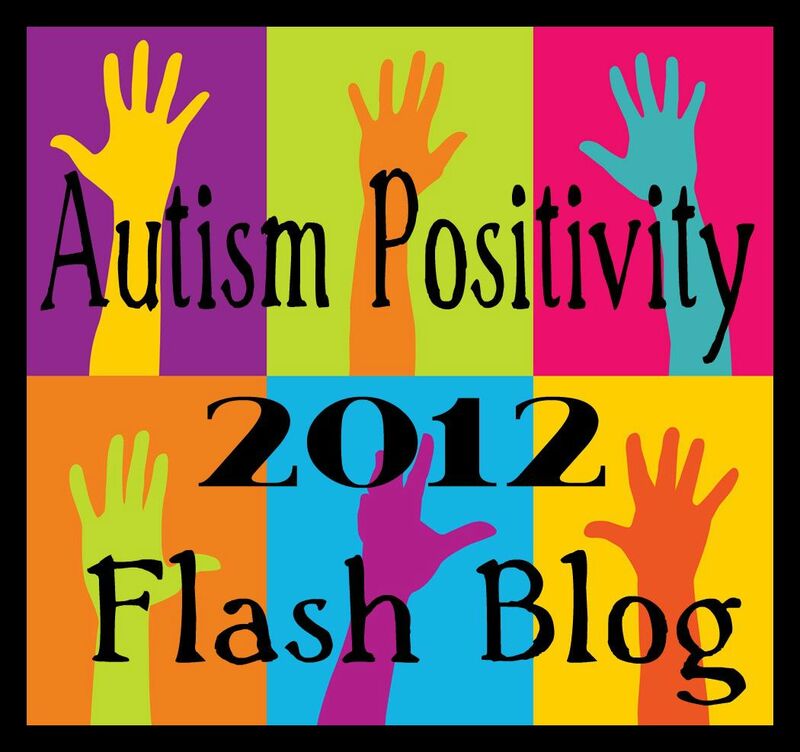 I often feel like I am trying to bridge a gap between autism, the general disability community and parents. In terms of self-advocacy the way I think about it in terms of my Son (who is a bit younger than H) is that I try to just give him positive encouragement and to answer his questions and talk about it when he wants to talk. Most of the time he isn’t interested in thinking about his autism, so I am trying to take his lead. It seems to me that you are giving H all the right messages. At the end of the day if he is confident about himself he will decide when it’s right for him to share with others. He is also a teenager and kids are always more self-conscious then, so I would say just keep doing the talking and giving him the positive re-inforcement and let him do the rest in his own time. Thank you for your kind and wise words. I appreciate you taking time to comment. H has only become more interested in self-advocacy in the past year. He really didn’t want to talk about being autistic much before that. I am very pleased that he is learning and becoming more self-aware. There is something so typical about H’s teenage response – and he is showing wisdom and self-understanding. I think that needs to be honoured and encouraged in our children, as this is one of the key beginning components of self-advocacy. Your son is fortunate to have a mom who has a connection to his experience – I don’t have that the same way – and have not experienced it myself. I have to watch – and listen – and I am fortunate to have people like you to build my understanding. just read some of your posts and i think you are doing a fantastic job 🙂 i have a son who is non verbal, just barely able to communicate andi have started occupational therapy for him. it seems to be helping him a bit. i just read your post where you mention that your son earlier used to haev tantrums. i would like to know how you helped him learn vocabulary to express himself. the main issue my son faces is – he gets angry when he is in a new enivrnment or among new people and wants t pinch and hurt everyone around him. i would really like it if you could help me out here as i have just started on this journey and feel hopeless and helpless . i ahve included my email , please do send me a reply . I am slow to reply- as I have been writing a post about meltdowns – which I intended would address some of your questions. Well – you know what they say about best laid plans – and I just haven’t gotten to it. I could tell you more about my son’s meltdowns – and that post may in fact make its way to completion at some point – but really you need support in knowing what is going on for your own child. Your approach or path to supporting your child may vary a little depending on where you live – as systems of support can be set up and organized somewhat differently. It can also depend on the age of your child. Now, it is not that we did not address those others areas and concerns – as they definitely did affect our child – and addressing those areas has had an impact upon his socially – but we really did focus on developing our relationship with our child. H has spoken language – so my experience is a little different that yours – but I do work with children who are non-verbal. As a starting point we have used approaches to build joint attention and co-regulation with these children. Craig and I used some of the strategies and resources from RDI (Relationship Development Intervention – “Solving the Relationship Puzzle”). We also used visual schedules and lots of visual supports, huge supports and strategies for transitions, tonnes of sensory integration opportunities (which is another post I’ve yet to complete), SLP, OT, Social Stories, etc. Wow. Just wow. Such a well written, lots-to-think-about post. My A-ha moment was this line: “if the only time we share that someone has autism – is when they are having a melt-down or struggling with something – then people only get to see the challenges.” Thank you! Thank you so much for your comment… and yes – that was that has been some of the big learning for me of late as well. I am pleased if the post spoke to you and has others reflecting along side me! It is nice to know I am in good company! Pingback: Car Talk (Not The Show): A Strategy | Simple. I Just Do. i really enjoyed your post and the comments. I don’t consider my self as “trying to change the world” more as changing one mind at a time. If we as a community, quietly change enough minds, the world will eventually change on it’s own. I have always had friends in the gay community as well as friends with significant physical disabilities. I think that there is a lot we as an ASD community can learn about the process of gaining acceptance and equality, from the experiences of others that have had to fight for the same type of acceptance. I am an adult with Aspergers living in Australia. I was diagnosed at the age of 32, and i am glad I was diagnosed late, if my parents had been told that i had autisim, there would have been judgments made about the things that i would never be able to do. (My parents are the type of people that prefer to remain uninformed) I have lived a very independent, adventurous life and I am more proud of myself and my achievements now that i have been diagnosed, as it seems I have spent most of my life doing things most aspies would never consider doing. I am happy to advertise my aspergers in any environment, and i own a few shirts to that effect. I want to have one made for when i start doing volunteer work in an autism resource centre that is soon to open it’s doors in my local community, “This is what aspergers looks like when they grow up!” It is a phrase i use quite often when i am introduced to parents of kids with ASD’s as it is a fun way to break the ice and let them know I am open to any questions they might have. I can easily “pass” as normal, but i prefer to “out” myself as i am happy to be all of who i am and i feel no stigma to being different. Isn’t everyone a little different in some way? I look forward to the day when saying “I have aspergers” holds no more stigma than being left handed or having red hair. I don’t feel we need to take a heavy handed, militant approach to change the way ASD’s are perceived, there are other minority groups that have paved the road for us already. I consider the other minorities groups (eg: gay rights, womens rights etc.) to be like our older siblings, as they had the arguments with our parents and paved the way for a more lenient approach for the younger members of the family. I hope that the world has matured as parents do, and that the “fight” should be easier for us, as the world as a whole has “grown up” over the last few decades. Thank you Wendy for sharing your story and for your wonderful thoughtful comment! The comments are so appreciated… they add layers of learning with the wise voices, insights, and perspectives of adults on the spectrum. I’m happy to have found your blog recently. We are kindred spirits sailing on the same ship! I am also labeled NT (for the most part :^), and we both strive to bring ‘awareness’ to ACCEPTING autism and autistic behaviors. I don’t have biological kids of my own, but every child I have worked with, either in music education or music therapy (hundreds, over the years) I feel are “my kids”, in that I would do anything I possibly could to help them to grow, musically, emotionally, etc etc. I will make sure to send it your way because it is quite relevant to the topics in this post. Let us press on in all things Neurodiversity! Thank you CJ… I will definitely be checking out your site! I love that you’re having this conversation. As hard as the truths can be to hear, acknowledging them is the only way to teach our kids how to not just function, but to love who they are in a world that so often conspires against that possibility. Thank you for sharing. PS Your son sounds kinda brilliant. Just sayin.